Tonight I witnessed the end of an era. The world champion Muay Thai fighter, Winston Walker, was ousted by a younger, stronger, faster man. Alex Gong battered the elder Walker, who finally decided to leave the ring; pushing his way through the crowd. It was a humiliating, career ending choice for someone who once stood at the top; yet, he chose, in the words of Roberto Duran: “No Mas”. Walker was outclassed. Gong put leg shots to his body that eroded any chance of good fortune for the aging fighter. Walker (excuse the pun) literally walked away. He quit! At the fight's end, several of Gong's attacks were misses or easily absorbed by Walker's cover ups; yet the “experienced” fighter knew that there were more to come. Can one blame him for choosing to end the fight? Perhaps he feared that one of next drives might cause irreparable damage and be the culmination of every blow he'd absorbed throughout his career. Fighting for a living or for glory doesn't make for better health in old age. Whatever the monetary or egotiscal desires might be, the vulnerability of human physiology must be considered. Imagine....this man looked down the barrel of a human gun and realized that he was done! No way! You fight to the end...that's it! Or, so the paid commentators said....as Walker returned to the stench of the arena locker room. The fight community does not accept the attitude of living to see another day. Career ending stories are unending. There's no need to date this entry, as the history of defeated champions is as common as that walk back to the changing room. Fighters can only last so long, no matter what their skill level. Unfortunately, for every champion, there are ten others eager to take their place. Many of these entertainment warriors are, pure and simple, the pinnacle of martial arts practice. Whether champions or “wanna be’s” they all become fodder used for the mass demand of violence as entertainment. 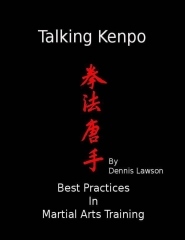 As I sat and watched this fight replay, I asked myself the question, “How does this relate to ordinary practice?” For the thousands of average practitioners in this age of martial arts shopping malls, what is the lesson? I saw a fighter at the top quit, to protect his future health. Most don't make it to the top, many do not have the good sense to know when it’s over; others don't have the sense to make a choice, as it's been beaten out of them over time. What about you and me? I was, once, a small time athlete, with glorious accolades driving my destiny to no end. Playing many sports, I experienced the thrill of winning and the disappointment in defeat. I experienced the role of champion. My well meaning family, coaches, and associates optimistically kept the ideal of greater athletic glory consistently moving forward. My name could be easily replaced by yours, Winston Walker's or Roberto Duran's. We are not all recognized champions. Even former champions must learn to agree to ordinary human stature at the end of their careers. The lesson that I take from that reality is this, Play hard…BUT be safe in doing so. When we “ordinary” champions practice- consider the entire training experience, as this approach will benefit your long term development as a martial artist. Continuing practice of the martial arts as we age requires taking care of your body, as well as those of your training partners. Train to your realistic restrictions not beyond any fantasy that defines your minute to minute illusion of Martial Arts glory. Take it easy on your partners and yourself! Train as if you are training for a lifetime. Martial Arts is a dangerous endeavor! Consider the person in front of you and practice control. Use punching bags and other training targets to study how your movements would impact at full force and speed. If you are training for a championship, remember the importance of respect, control, and honor. When the polish is gone from your trophies, these character traits will continue to shine. Martial Artists don’t just fight for a particular championship, but practice for protection and better health. Don't leave the ring, embarrassed, as you grow in the art!